Kelly Baker, founder of Danny Donkey & Pals, was previously Head Girl at the Diamond Centre for Disabled Riders and also managed a centre providing equine-assisted therapy for people with disabilities. During this time it was apparent that transporting large numbers of pupils from schools could be problematic. 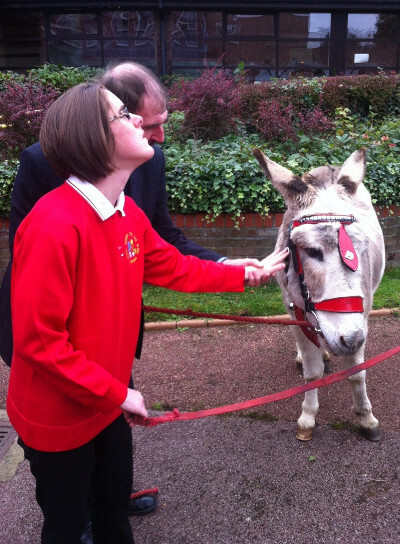 Kelly decided to set up a mobile service, taking donkeys into schools to run sessions, thus relieving them of the transport burden and allowing more pupils to have access to the benefits the animals bring. 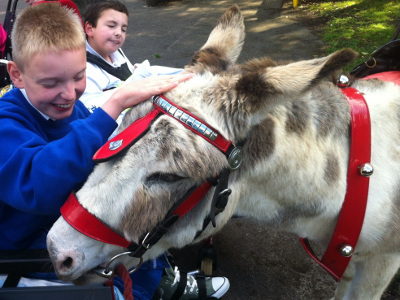 Donkey-assisted therapy is an incredibly sensory experience, engaging vision, hearing, touch and smell. For the very disabled, just touching the donkeys can have a positive effect. They are gentle enough to be led by even the frailest children and are happy to slowly walk beside wheelchairs, giving wheelchair-bound people the freedom to take them for a walk too. Children under 52kg can ride the donkeys and the benefits are huge, including improving balance, co-ordination and strength. The rocking motion mimics the natural movement of the pelvis during walking and trains the body to move in the correct way, whilst also building muscle. Our ridden therapy sessions can be as comprehensive or as basic as required. 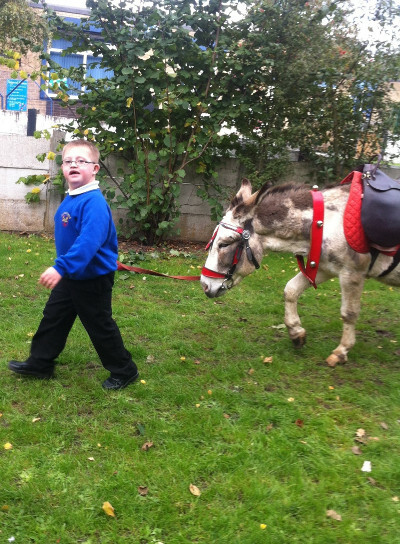 Some children may need support from several adults surrounding the donkey and will just take a few steps. Others play games, posting letters, weaving in and out of cones and balancing eggs on spoons. All of our donkeys are trained to remain calm and steady in all situations and we use saddles with handles on to provide stability. Those with speech impediments tend to communicate more easily with non-judgmental animals than they do with other people. In several cases, children who have been reluctant to communicate with people are happy to chat freely to a donkey after spending some time with it and the benefits are becoming more widely acknowledged: "Equine facilitated psychotherapy with children with autism and Down’s syndrome has, in many cases, been effective particularly in the areas of speech and fine/gross motor skills improvement (Mallon, 1992)." Grooming and feeding the donkeys teaches a sense of responsibility and also improves fine motor skills and hand to eye co-ordination whilst being a fun, sensory experience. All of our donkeys wear a set of bells to provide further stimulation and allow visually impaired people to identify where they are. 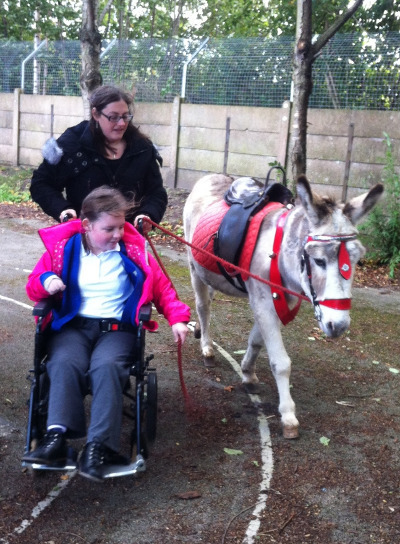 "Our 'Donkey Therapy Day' was a truly multi-sensory experience for our children, who all have severe visual impairments along with both learning and physical disabilities. The moment the donkeys arrived there was an explosion of sensory stimuli - amazing smells, bells which jingled and the tactile experience. The donkeys were incredibly tolerant and took it all in their stride. 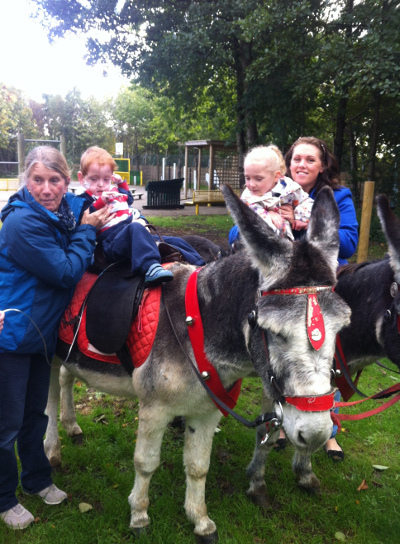 Some children were able to have a ride and the smiles of everyone were evidence of a wonderful donkey day!" "Thank you so much for bringing the donkeys to school. They were total stars - and so popular that the children are still talking about them three weeks later. We would love to have you back again!"